PTFE(Teflon) baking liner, also named oven liner, cooking liner, baking sheet, baking foil etc. 1) PTFE-fiberglass; nonstick coating on both sides prevent sticking without oils, grease, sprays or butter, easy cleaning, re-usable. 4) dishwasher-safe and safe for contact food, chemical resistance etc. 4) used a microwave hot liner etc. 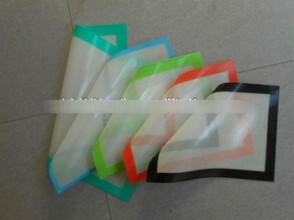 Other thickness like 0.18mm, 0.25mm are also available.